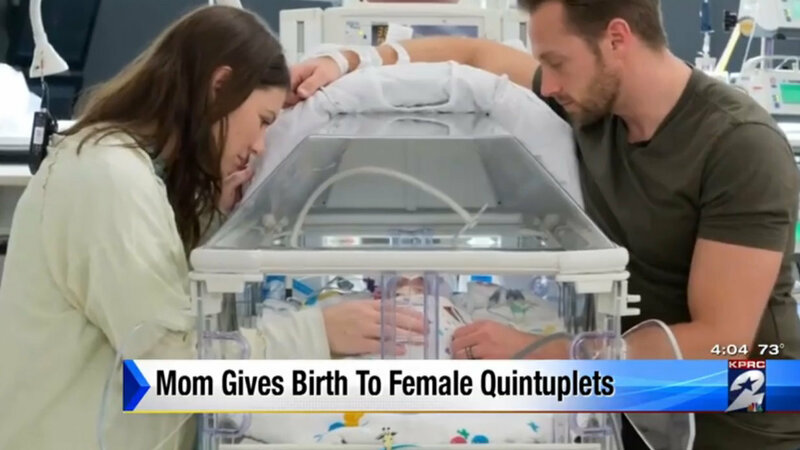 For the first time in the U.S., a set of all-female quintuplets has been born. Quintuplets are extremely rare, but for Danielle and Adam Busby, they definitely hit the jackpot. They welcomed five girls when they delivered their quints, a feat so unusual that it hasn’t happened anywhere in the world since 1969, and it hasn’t ever happened in the U.S. The girls, Olivia Marie, Ava Lane, Hazel Grace, Parker Kate and Riley Paige, were born via C-section at 28 weeks, two days — around 12 weeks earlier than the average singleton birth. And it was a rapid delivery too, with all five babies arriving within four minutes. The couple had trouble conceiving, and they had a daughter a few years ago with the help of IUI (intrauterine insemination). They went that route this time but got a lot more than one baby. Mom worked hard to maintain the healthiest pregnancy possible, and one of the doctors who helped deliver the quints said that all the babies are healthy, they weigh what they should for their gestational age and that they are requiring only a little bit of help breathing. There were over a dozen medical professionals on hand for the delivery, and they also brought on seven neonatologists to assist with the girls after their birth. According to the CDC, there were only 66 births of quintuplets (or higher-order multiples) born in the U.S. in 2013 (when compared to the 3.9 million total births that year, you realize that’s a tiny fraction). As with most premature births, the babies will need to remain in the hospital until they get closer to 40 weeks of gestation, so based on early reports, they are doing well enough that they should get to go home with their family in a few months. Congrats to the Bubsys! You can follow along with them at their blog to see some amazing videos and check out photos of the family as they adjust to their five new girlie additions. It is always fun to see how parents of high-order multiples tackle the tasks of feeding, diapering and clothing their huge brood, so their blog should become even more wonderful when they go home.